During the month of September, I read WAY more books than usual. One of the reasons that was possible was because I decided to focus a lot more attention on young adult and middle grades books, and I gravitated toward books about characters with autism, in particular. Although those books were quick to read, they were also very emotionally powerful. 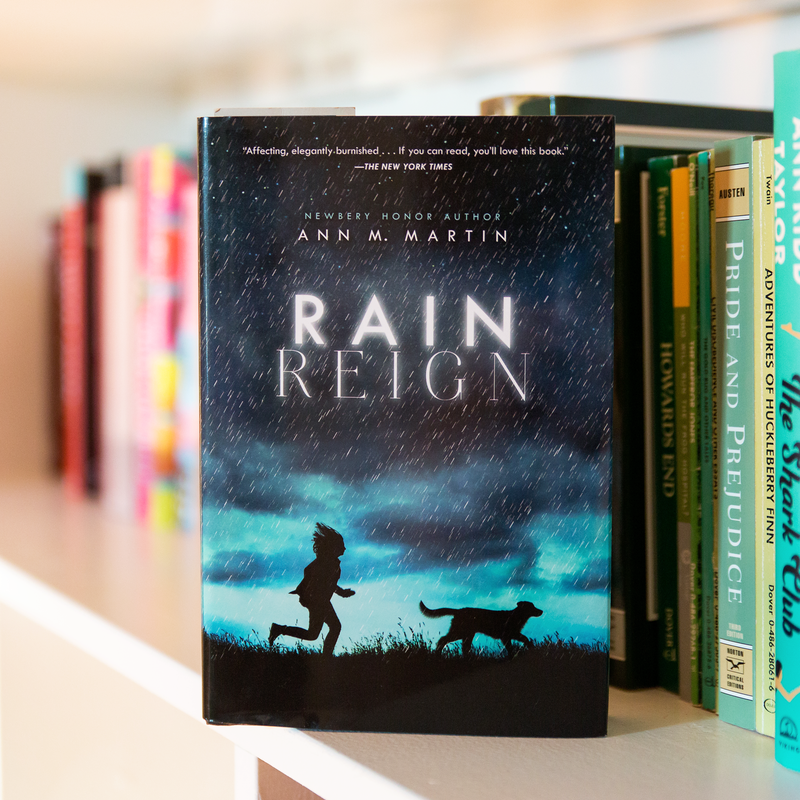 Rain Reign by Ann M. Martin was one that I read almost completely in one sitting, but the emotional book hangover I experienced stayed with me for days afterwards. I first heard of this book several months ago, but at the time, I didn’t understand the appeal of reading middle grades books as a 30-something adult. However, after reading The One and Only Ivan by Katherine Applegate on a whim in August, I started to rethink my decision to steer clear of younger fiction. Since then, I have come to realize that middle grades and young adult books are quick and wonderful ways to bring myself out of a funk while experiencing the writing of excellent writers with important messages. Ann M. Martin is more than just an excellent writer with an important message, however. Instead, Ann M. Martin is the absolute foundation for my love for books. When I was younger, my mom would literally beg me to spend my Christmas and birthday money on books instead of new toys that I didn’t need. I enjoyed reading, but it wasn’t a priority for me. That all changed when a cousin of mine gifted me with a giant box of her old books. Inside that box were many of the first books in The Baby-Sitters Club series, and as soon as I read the first one, I was hooked. Once I finished all the books from my cousin, every penny of my money from that point forward went to buying all the other books in the series and a bookcase to house them all, which I still have. I would give anything to have all those books back in my life, but sadly, I sold them all in a yard sale in my teenage years, not realizing the sentimental value those books held. Although she has been writing for decades now, Ann M. Martin has not lost her magic on me one bit. As soon as I read Rain Reign, I started looking for more of the books she has written since I moved on from Mary Anne and Kristy and all my BSC friends, and I’m looking forward to exploring more of her writing. Rain Reign grabbed my attention because it features a main character with autism, Rose. Combine that with a beloved dog featuring prominently in the plot, and I knew that I was in for an intense emotional journey. The book is told from Rose’s perspective, and readers quickly learn a great deal about her. She has high-functioning autism, requires the assistance of an aide at school, focuses intensely on homonyms and prime numbers, and absolutely loves her dog Rain, whom she named because her dad found her in the rain outside a bar and because rain has two other homonyms (rein, reign). Her relationship with her father is difficult, to say the least. He is a single father who has a quick temper and suffered abuse as a child himself, he stays out drinking many nights, and he doesn’t understand (or attempt to understand) Rose much at all. Luckily for Rose, her uncle Weldon does his best to make sure Rose is well-cared-for, but she still struggles to fit in at school and often gets teased. Most descriptions of Rain Reign will tell readers that this book is about what Rose experiences when Rain goes missing during a major storm; however, this book is really the story of Rose’s struggle to understand herself and the world around her. From the very first page, I found that Rain Reign drew me in and didn’t let go. I could hardly put this book down at all, and toward the end, I actually found myself chewing my fingernails in anticipation of what would happen next. There are several big surprises that take place that I really wasn’t expecting, even though I was genuinely wishing for a couple of them. And without revealing any spoilers, a couple of others broke my heart in half. Ann M. Martin has written a book that will definitely be enjoyable for preteens, teens, and adults alike. Rain Reign includes valuable lessons about accepting others, including the quirks we might not understand, but she also makes powerful points about the effects of parental abuse, judging others, and doing what’s right, no matter how hard that might be. Rose is an absolutely wonderful character whose genuine voice and frankness made me want to gather her in my arms every time she started shouting prime numbers on the brink of a meltdown. Somehow, Martin has managed to get inside the mind of a child with high-functioning autism and create a character who does justice to all the people in the world on that particular end of the spectrum, and most importantly, she shows that character has a heart that is pure and good. Our world is filled with misconceptions about people with autism, and Martin’s portrayal of Rose is a powerful tool that fights those misconceptions. I am especially grateful that I decided to explore younger fiction after reading Rain Reign, and I can’t wait for my sons to get just a bit older so that I can share this beautiful book with them. Posted in middle grades fictionTagged Ann M Martin, book about autism, book review, characters with autism, Fiction, fiction review, middle grades book about autism, middle grades book review, middle grades fiction, quirky characters, Rain ReignBookmark the permalink.